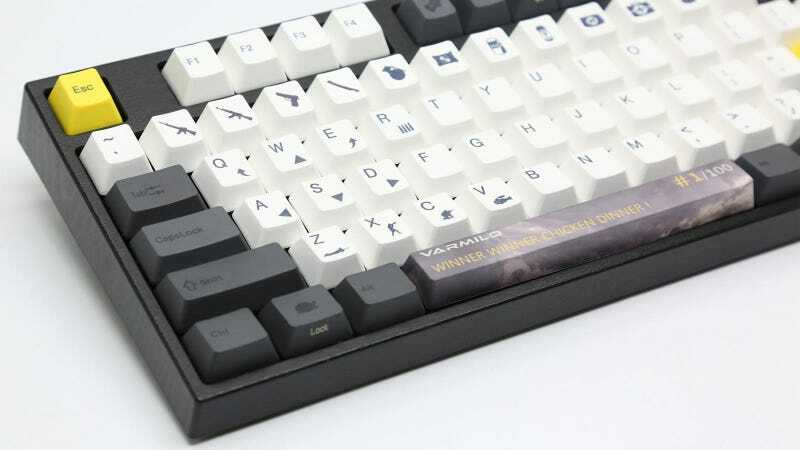 The space bar of Varmilo’s “Chicken Dinner” keyboard is no substitute for actually winning a round of PlayerUnknown’s Battlegrounds, but it might serve as a reminder of past triumphs, depending on how good you are. Chinese company Varmilo makes a nice keyboard, and it’s not afraid to go a little crazy with the custom keycaps. Case in point, this unofficial PUBG version of its popular VA108M and VA87m models. The boards are decked out in a lovely combination of black, white and gold PBT keycaps, many of which feature icons to coincide with their in-game shortcuts. Combined with a faux black wood grain case, it makes for a very attractive addition to one’s PUBG arsenal. The VA87M loses the number pad, replacing it with a grey bar that says placeholder image. The space bar might be a bit much for some, as will the price. The Chicken Dinner keyboards run between $131 and $169 over at Mechanicalkeyboards.com depending on size and switch selection.